When Mike and I started training for our first sprint triathlon the one thing that we were a little unsure about was transitions. 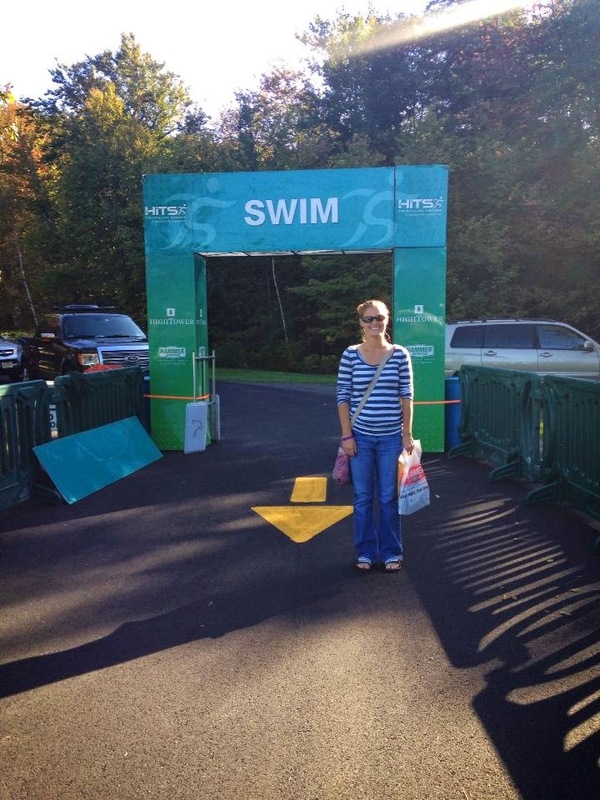 As a swimmer growing up, I had never done anything that required me to transition from one sport to the next, all while remembering to have everything that you need with you to survive out on the course. 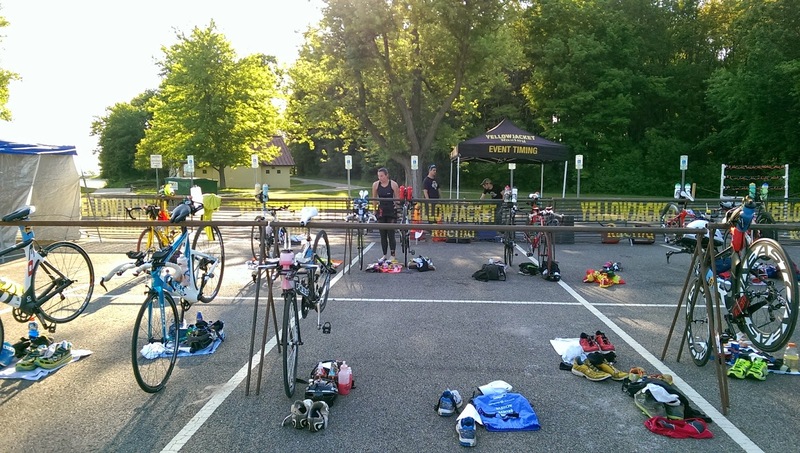 We simulated transitions as best as we could, which is a little more difficult when you are by yourself since you have to secure your stuff (especially your bike), and we also did a duathlon before the triathlon for transition practice. Even now that we have finished six triathlons, including a 70.3 and 100 mile triathlon, we still practice transitions through brick workouts and going to RBR (run/bike/run) and SBR (swim/bike/run) workouts with the RATs, our local triathlon group. 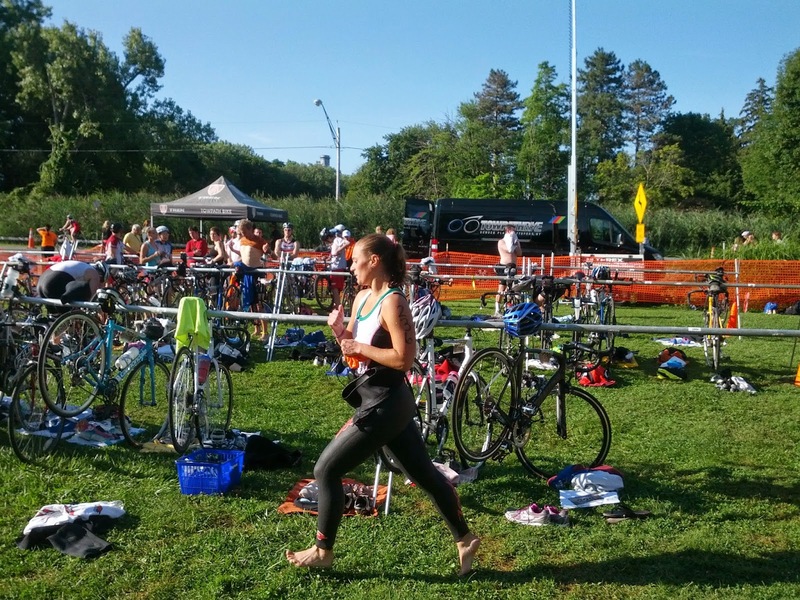 For new triathletes the thought of swimming, biking AND running one right after the other can be daunting enough, especially when the swim is in open water. Then you talk about the "transitions" and for some the concept can be hard to grasp. 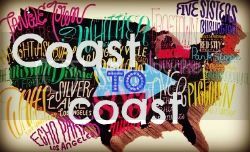 Here are some tips to help you get through your transitions easily (I have never experienced a race that had two transition areas, drop bags, etc. and I won't until our Ironman in August). I already mentioned that Mike and I practice our transitions. We do this on our own with swim/bike workouts and bike/run workouts. Granted, our transitions are slower and we don't have everything laid out exactly as we would in a race but it gets our body used to the physical act of transitioning. Getting out of the water your heart rate may be higher, so I take the time to spin easy for a few minutes to bring it back down. Also, they aren't called "bricks" for nothing! 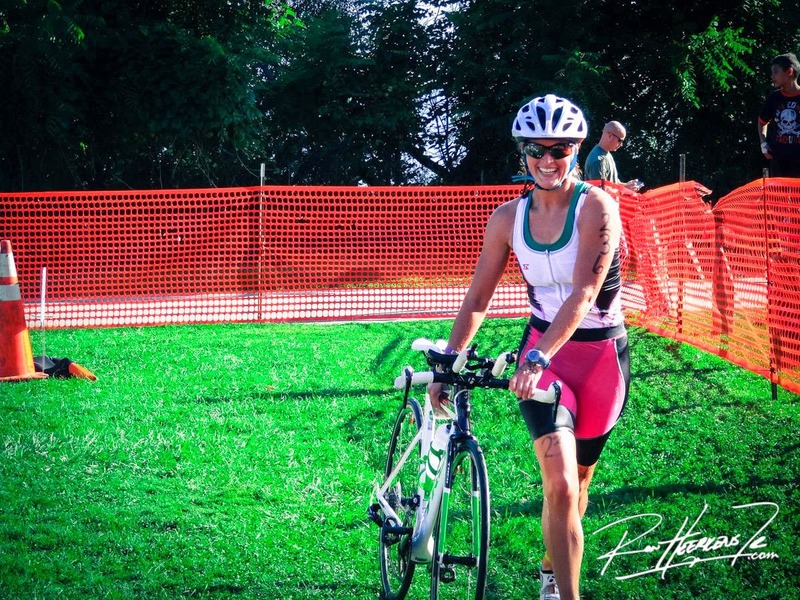 Your legs will feel heavy as you transition off of the bike and into the run. 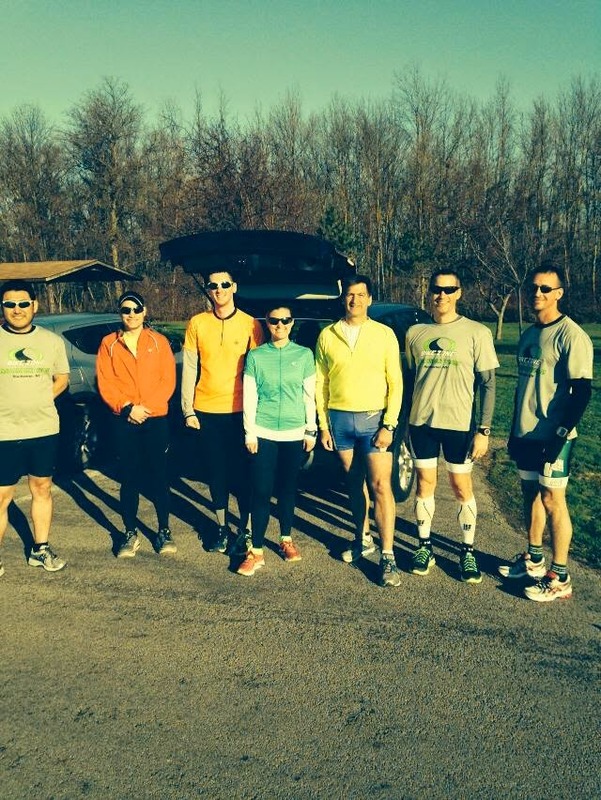 We get more "real" transition practice at our workouts with our triathlon group, the RATs. There is usually an area where we can leave our stuff in between each sport and we can practice timing. If you can't do that, then try setting up a "transition area" at your house and have someone watch your stuff. This will help you get a feel for what order you do things in, how quickly you will transition, etc. The night before a race I have all of my stuff in my transition bag (this is helpful for carrying your stuff to and from your transition area) and I have my nutrition that I will need already on my bike. Mike and I buy water for our bottles, but most races will have some water available for you to fill any bottles that you may need. Some races assign you a transition area, usually based on what race you are doing and your race number, and others are self-selected. If it is a self-selected transition area, I try to find a spot closer to the "bike out"/"bike in" because that means I will have less time running with my bike and in my bike shoes (I haven't practiced the art of leaving my shoes clipped in to my bike and getting my feet out, yet). Either way, I will look for a landmark that will help me identify my transition area. Don't count on being able to recognize your bike easily after getting out of the water or finding your spot sans bike after finishing the ride. I look for a tree, a post, count the number of rows, use a bright towel, etc. I set up all of my stuff so that I can get it easily, my nutrition and bottles are on my bike, my bike shoes are ready to put on (I don't wear sock on the bike), my helmet and sunglasses are ready, I bring a small towel to dry off if I need it, my running nutrition, shoes (with lock laces) and socks are set out, body glide and sunscreen. Makes sure you BRING your cap, goggles and wetsuit (if allowed) with you out of the transition area before it closes. 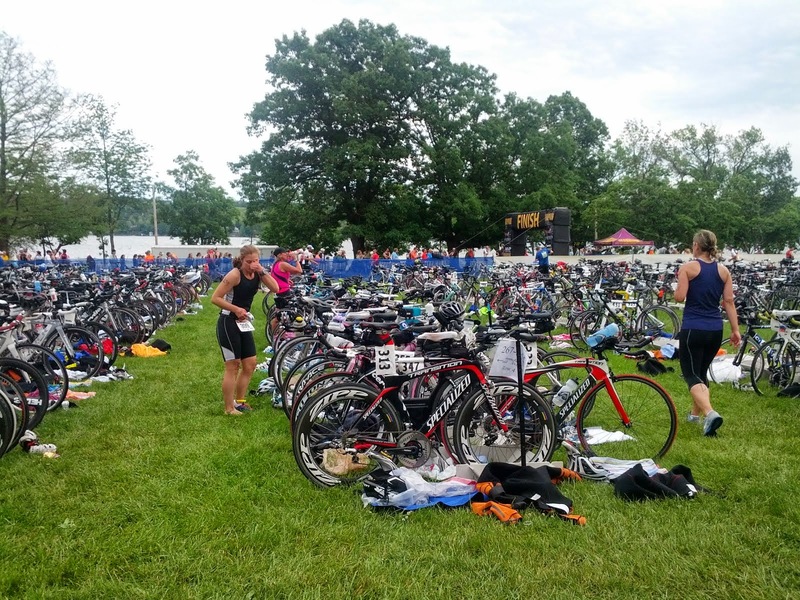 Once the transition area closes, you may not re-enter until after the race starts. After setting everything up, I look for the "swim in", "bike out", "bike in", "run out" and the finish line. I want to reduce the amount of time that I spend looking for these things later. Transition 1, or T1, is the first transition of a triathlon (which is usually from the swim to the bike). While I am swimming I start to think about what I have to do while in T1. If I am wearing a wetsuit, I will unzip the wetsuit while I am running out of the water (some races have no wetsuit stripping zones, for example, up stairs, so make sure you follow the rules). I take my cap and goggles off and run with them in my hand into transition. A different kind of transition, a relay! Once in transition, I get the rest of my wetsuit off and then put on my bike shoes, sunglasses and helmet. DO NOT unrack your bike without your helmet on and the chin strap fastened. I will put any extra nutrition that doesn't fit on my bike (clif bars) and a spare tube in my tri top's back pockets. Then I unrack my bike and I am on my way! There are mount/dismount lines for the bike, so make sure you get on at the right time. Transtion 2, T2, is just that - the second transition in a triathlon (typically bike to run). 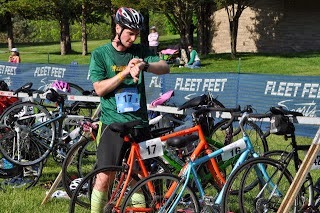 After I dismount at the line, I run my bike back to my transition area and re-rack it. I will then take my helmet off, take my shoes off and get ready for the run. I do wear socks while running and put my shoes on (luckily, lock laces make it so you don't have to tie your shoes). My bib number is on my spi-belt (you don't need it on the bike since you have a number for your bike) so all I have to do is put that on. I grab any nutrition and hydration (possibly a hand-held) and then I am on my way to the run! Some people, unfortunately, don't realize that the time that is spent in transitions counts toward your overall finishing time. Therefore, you need to practice, organize your stuff accordingly and think about what you are going to do once you get into T1 and T2. 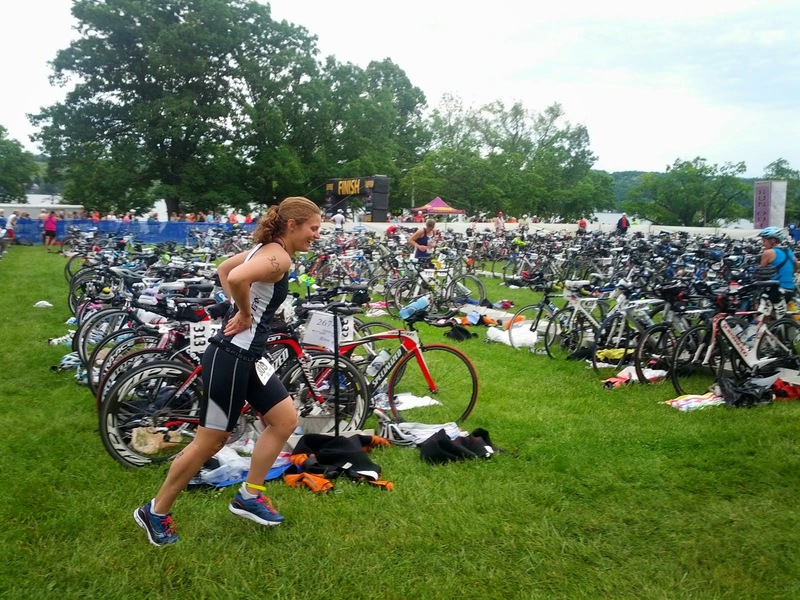 In sprint and Olympic distance triathlons, your transitions shouldn't take that much time. Of course if you are new to the sport, don't worry about it taking a little longer. My first sprint triathlon my T1 time was 2:27 (and I didn't even wear a wetsuit) and my T2 time was 1:24. 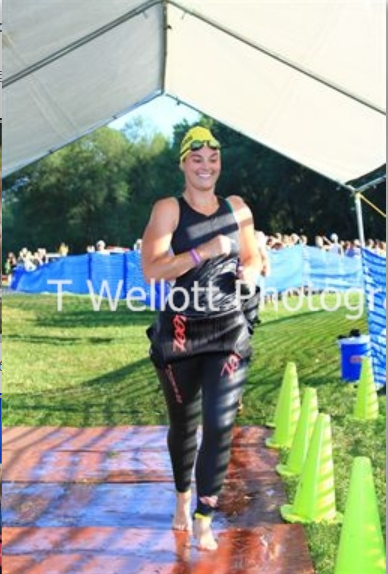 My last sprint triathlon my T1 time was 1:21 (wearing a wetsuit) and my T2 time was 1:23. Of course, comparing race to race is difficult because it all depends on how close/far away you are from the exits and entrances and the size of the transition area. In longer distance tris, typically 70.3 or above, the time spent in transition is even more important. You don't want to rush out of there and forget your nutrition, spare tube, etc. just to try to save a few seconds. However, you also don't want to spend too much time in transition because everything counts. The race director at our 100 Mile Tri said, "100 miles is a long way". He said this while talking about taking our time in transition, making sure we had everything we needed and to take care of ourselves. Some people need a little bit of a breather in transition, if that's you, that's alright! I still like to try to be as quick as possible, but I definitely make sure I have everything before I leave. I am not sure, quite yet, how long I plan to be in transition at our Ironman. The transitions will be a little bit different since we will have transition bags with all of our stuff, changing tents (which we have had at other races but never used) and volunteers who are ready and willing to help us. Next week's topic is - gear! 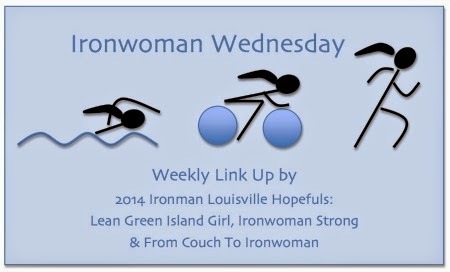 I'm, training for my first half iron man and these are some great tips! nice post!! where you guys keep your nutrition on your bikes? We both have bento boxes on our bikes. Mike's is a bit bigger and can fit more nutrition, CO2 cartridge, etc. Mine is one made for the Trek Speed Concept and I can fit my energy chews and energy gels in there. What kind of wet suit do you recommend? Are they really necessary? Full or half sleeves? To the knees or ankles? What is best? How hard are wet suits to get off? 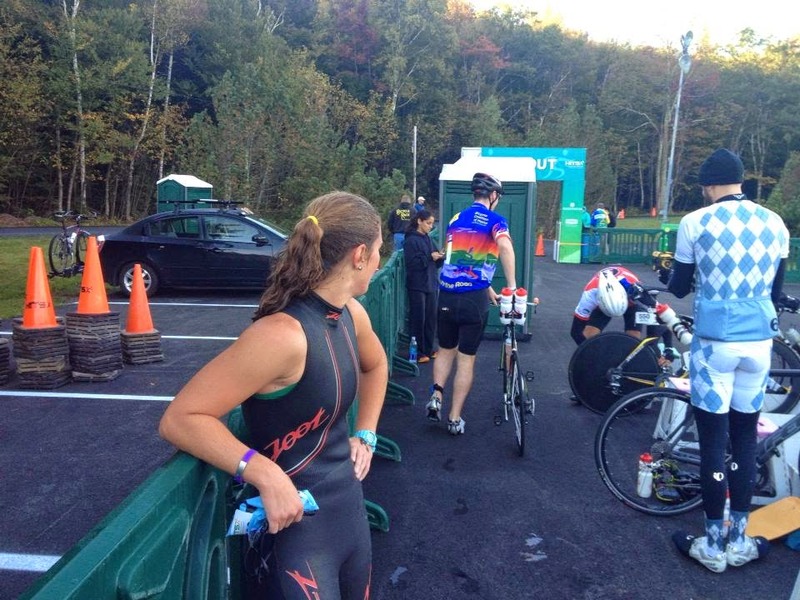 Don't you over heat in a wet suit waiting for the race to start? This is what I worry about. Thanks! I am a strong swimmer, so I haven't always raced in a wetsuit (even did one in 62 degree water or colder without). However, I think that they are helpful. Of course if the water temperature is above 78 degrees the race is considered wetsuit illegal (you can still wear it you just cannot be eligible for awards). If the water temperature is above 82 degrees then no one can wear a wetsuit. I have a sleeveless wetsuit, I think most wetsuits go to your ankles. The type you get is all dependent on what your preference is and how strong of a swimmer you are. I felt that a full body wetsuit would be too restrictive. Of course in really cold water a full body is probably better. Use body glide to help get the wetsuit on and off, and work your way up your body as you put it on (put both feet in then pull it up as you go). It really isn't too difficult but you should practice. Also, I don't think you will overheat while waiting but you can put it on halfway and then right before put it on all the way and ask someone to zip you up. I haven't had any problems, especially since the swim is in the morning when it is still relatively cool! And if it isn't cool out, it probably is wet suit illegal anyway! You have some really good information about transitions. I like the landmark one as well. It's so confusing as you come out of the water. Thanks for the post! Great description. I bet it takes a lot of practice to transition from one to the other as quickly as you do. I LOVE passing people in transition--it's free time! I want to work on my flying/in-motion mount/dismount next.